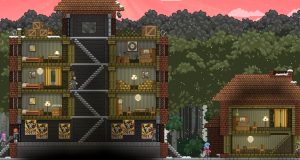 The Apex are one of the seven playable races in Starbound, and one of the six races entrusted with an Ancient artifact. They were originally a much more human-like race until a completely natural mysterious water-borne pathogen of unknown origin threatened their survival. Fortunately the ruling government, known as the Miniknog, had developed a cure that countered the harmful effects of the pathogen... with the unexpected side effect of starting the VEP (Vestigi-Evo Process), which "devolved" their bodies to a more ape-like state. On the other hand, it also greatly increased their mental capabilities, leading to even bigger advances in super-science. This process took less than ten years to spread to the entire race, and also coincidentally at the same time the Miniknog began a complete societal purge restructuring. All records of the Apex society prior to VEP were destroyed, and the Miniknog's leader Big Ape took complete and total control over the Apex society... for their safety and security, of course. Apex leadership dictates jobs, the economy, fashion trends, food rations, and who "volunteers" for tests in the advancement of Apex biological science. Big Ape's rule is so all-encompassing that nobody knows exactly how long Apex society has actually been this way. And thus the Apex were happy and complacent, under the watchful eye of Big Ape and his many, many, many surveillance cameras and heavily-armed guards. For some reason this has bred resentment in some very ungrateful and rude Apex, and rebel cells have begun to pop up here and there but it is such a small thing really, and totally not a huge undercurrent that has spread through the entire society. Carry on about your day, citizen. Big Ape is watching you. As with the other player races, Apex characters are given a set of uniquely-styled Armors, their own Ship type (with included Pet), and two unique Mech bodies. The Apex equipment leans towards a "citizen's militia" aesthetic. Their stats are the same for all other race's equipment at the same Tier. Crafted weapons are the same for all races, save for the pistol-packing Novakid. While race-specific crafted items can be traded between characters of different races and used freely, there is currently no mechanism to allow a character to craft other races' unique items, or obtain a different Ship (and Ship Pet) in any capacity, without modding the game. An Apex player has four sets of race-specific Starter Clothing to choose from in the Character Creator, plus the standard-issue Protectorate T-Shirt and Protectorate Vest. These items have no defensive capabilities whatsoever. These four sets are also used to clothe randomly-generated Apex NPC villagers. All four sets can also be crafted at the Spinning Wheel and Sewing Machine. These Armor sets have the same stats as their equivalent Armors for all other races. There are a number of Apex-related Cosmetic Armors to be found scattered across the universe, usually in Apex-themed Dungeons, but sometimes in random/Biome chests. Like the Starter Clothing, these have no defensive capabilities, but let the player customize their character's appearance. The Apex Ship is a sleek, ultra-modern craft covered in (nonfunctional) guns. Its size can be expanded by obtaining more Crew members, which allows the player to buy a higher-class Ship Licence from Penguin Pete for every two more Crew members. Alternately, the player can buy counterfeit licenses from Penguin Bay: these licenses are expensive, but do not have crew requirements attached to them. Once upgraded to the Condor Class (the largest Ship class), the Apex ship is a gigantic diamond-shaped arrangements of room that is largely symmetrical both vertically and horizontally. Apex ship pets are Weasels, coming in one of ten different colors chosen at random. Apex player-characters have the ability to craft two unique Mech body types. The Dominion-00 Mech Body is the first Mech body the player will obtain, by completing Dr. Akaggy's "Test Drive" quest at the Outpost and unlocking the ability to use Mechs. Its advanced version, the Dominion Mech Body, is obtained by completing Akaggy's later "Advanced Test Drive" quest. These two bodies have the same stats as other races' "default" Mech Bodies earned from the same quests. Apex NPCs are very common. Lone Apex Merchants can pop up on nearly any world (both through normal planetary generation and temporarily as part of a Quest), and spaceships and space stations may have Apex crew. Apex will often appear as NPCs in mixed-race planetary Microdungeons such as Savannah settlements or Tundra science stations. Apex villages and dungeons can be found on all planet types that can have surface-level full-sized dungeons except for Lush (aka "starter") planets. They are most likely to appear on Tundra planets over any other type. Apex structures lean towards "modern" to high-tech styling. Miniknog-controlled areas are covered in Big Ape propaganda and security camera (both obvious and hidden), whether the structure be a beige cookie-cutter "Standard Issue" apartment living space or bright-grey sanitized science lab of dubious intent. By contrast, Apex rebel camps are grubby affairs of scavenged supplies and hastily-constructed bunkers. The player can discover Miniknog bases as Space Encounters. Like the planetary Miniknog Bases, these areas are full of guards and scientists who will attack the player on-sight. The bases also have a slight puzzle element to them, requiring certain doors to be unlocked from different areas of the base in order to proceed. These bases are "shielded", which prevents the player from mining its blocks and bypassing the puzzles. At the Outpost, Apex scientist Elliott offers a large number of Quests that allow the player to unlock three different types of Tech. This Quest chain is available as soon as the player first visits the Outpost. The Quest to find the Apex Artifact is the fourth of the five Artifact Quests the player must undertake. This two-part hunt first involves finding Apex decor items and scanning them, giving Esther data to locate the Artifact's whereabouts. Once she has enough data, the player can travel directly to the Miniknog Stronghold to retrieve it, where the player gets accidentlaly involved in an Apex rebel strike. A variety of Apex Tenants can be summoned by placing a Colony Deed in a suitably-furnished room. These types of Tenant can be any race, dependent on the furniture in the room. If there is not enough race-tagged furniture in the room, the Tenant's race will be chosen at random. Like the Basic Tenants, these Guards can be any race, dependent on what furniture is placed in their room. Their Armor and combat stats are based on the type of crafted tiered furniture placed in the room. These Tenants' race is not dictated by furniture tags, but random-chance among a limited selection of races. Only the Miniknog Researcher will always be Apex; the rest also have a random chance to be Human, plus the Scientist may end up as a Hylotl. These Tenants can be any of the seven playable races, but that race will always be chosen at random, regardless of the racial tags of the room's furniture. Apex feature in a good number of Codex books, both written by Apex and by other races. The player can find fossilized remains of Apex underground on most planets by successfully completing a fossil mini-game. The prizes for completion are randomized, so it may take a lot of tries to obtain even a single piece. Once a complete set of skull, torso and legs has been collected, they can be placed in a Medium Fossil Display, forming a complete Apex skeleton to be put on display as a decor item. This also completes entry #13 in the Fossil Collections Library. Once the skeleton and display have been combined, they cannot be disassembled. The player may also find the Apex Skull Mask Cosmetic Armor piece in Bone Chests scattered throughout Bone Biomes. Much of the Apex society is based on the novel Nineteen Eighty-Four, a dystopian future novel where the all-seeing "Big Brother" keeps a cowed population in check.